Garfield encounters crime, passion and suspense as he becomes embroiled in a murder mystery in this ½ hour special. A parody of film noir mysteries, "Garfield's Babes & Bullets" gives our feline the chance to play hero as he imagines himself as Sam Spayed, an ace detective who's been chosen by the mysterious Tanya to find her husband's murderer. 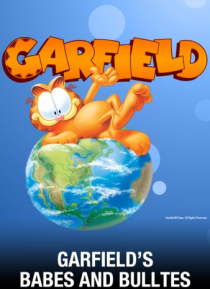 Shown in black and white, the show is written by Ji… m Davis, based on a story by Ron Tuthill, and features the voice of Lorenzo Music (Garfield) and original music by Desiree Goyette and Ed Bogas.